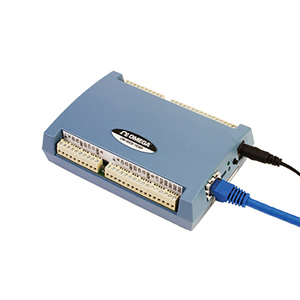 The OM-WEB-TEMP provides 8 temperature channels and 8 digital I/O channels. The included external power supply (ac adaptor) is used to provide power. On-board LEDs display the status of communications and external power. All hardware configurable options are selectable with the web browser or the included InstaCalTM utility software. Network configurable options are settable using InstaCal. When using InstaCal, if the login settings have been changed from the default, a login name and password are required to change the configuration settings. The OM-WEB-TEMP provides a 24-bit analog-to-digital (A/D) converter for each pair of differential analog input channels. Each pair of differential inputs constitutes a channel pair. A different type of sensor (i.e., thermocouple, RTD, thermistor or semiconductor) can be connected to each channel pair, however both channels in the channel pair need to be the same sensor type (although if thermocouples are connected it is possible to mix thermocouple types). The OM-WEB-TEMP provides four integrated cold junction compensation (CJC) sensors for thermocouple measurements and built-in current excitation sources for resistive sensor measurements, Each CJC sensor is dedicated to one of the four channel pairs. An open thermocouple detection feature allows detection of a broken thermocouple. An onboard microprocessor automatically linearizes the measurement data. The OM-WEB-TEMP features 8 independent temperature alarms, Each alarm controls an associated digital I/O channel as an alarm output. The input to each alarm is one of the temperature input channels, The output of each alarm is software configurable as an active high or low. The user configurable threshold conditions activate each alarm. When an alarm is activated, the associated DIO channel is driven to the active output state selected. Eight digital I/O channels are provided to communicate with external devices and to generate alarms. The digital bits are software programmable for input or output. The digital output voltage is switchselectable for 3.3V or 5V logic. A screw terminal is provided for pull-up or pull-down configuration. The OM-WEB-TEMP web interface displays current data read from the device and does not log or store historical data. Use the included TracerDAQ software to log or graphically trend your data. The OM-WEB-TEMP module ships with an impressive array of software, including the new TracerDAQ®, a fullfeatured, out-of-the-box data logging, viewing, and analysis application; Universal Library™; ULx for NI LabVIEW (comprehensive library of VIs and example programs compatible with 32- and 64-bit LabVIEW v8.5 through 2011) and InstaCal™ installation, calibration, and test utility—powerful software solutions for programmers and nonprogrammers alike. These modules operate under Microsoft Windows XP/VISTA/7 (32-bit and 64-bit) operating systems. Configuration: Each DIO bit can be independently configured for input or output. Switch selectable output voltages of 5V or 3.3V. (user configurable for pull-up mode to 5V or pulldown mode). Nota: Comes complete with an ethernet cable, 100 to 240 Vac ac adaptor, quick start guide, software and operator’s manual on CD.